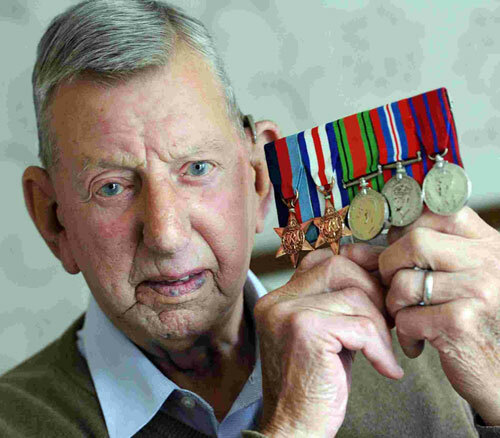 Commemorating the 69th anniversary of Operation Market Garden (Arnhem, Holland, 17–25 September 1944) is WW2 veteran Arthur Shackleton, 94, from Dorchester. He will be making an historic journey to the battlefields of Holland 69 years on to attend key commemorations and pay respects to old comrades. Arthur will be supported by the Big Lottery Fund’s Heroes Return 2 programme. Arthur was part of a force of over 86,000 men who were involved in a daring operation to seize control of bridges and river crossings in Germany and the Netherlands. The Allied assault (September 17-25 1944) was initially successful, but ultimately ended in defeat with thousands killed and many more injured or taken prisoner. Aged 25, Arthur was a Staff Sergeant, First Pilot in the Glider Pilot Regiment. Piloting a Horsa Glider, he transported troops from the South Staffordshire Regiment to a designated landing strip at Wolfheze, 8 kilometers from Arnhem, as part of the first wave of landings on Sunday 17th September 1944. Arthur and comrades then came under intense air bombardment from Messcherschmidt fighters. The Parachute regiment decided to put in an attack on Arnhem, and the troops positioned themselves outside of the town. Arthur and comrades took possession of a derelict house . He recalls, “It was very dark, very eery, the windows were all blown out and the wind was whistling through. At dawn we started the attack. But they were waiting for us with Panzer tanks. Three hundred and fifty of us were killed in just one hour. It was over three quarters of our number. We were finally given the order to retreat and went back to Oosterbeek where they positioned themselves in and around the Hartenstein Hotel. It was 10 days after their initial landing that the troops finally got the order to pull out. “At first it was numb then it started to hurt really badly as I got down to the river bank. I was put in a boat with other wounded. Arthur was pulled to safety and after receiving medical treatment he was taken to Brussels and from there brought back to Birmingham where he recovered in hospital and finally discharged in late October 1944. However, Arthur was soon back in service and later took part in the Rhine Crossing of 1945, which eventually led to the defeat of the Germans. Just got to the Memorial. Seeing it close up for the first time and seeing the engraving of the Halifax is brilliant. As we are here Wesley and his parents arrive to look at the flowers. We learnt that the flypast last night, which was impressive, two Harvards, flew over us seven times – once for each airman of the Halifax. A second heartfelt goodbye to a remarkable young man. What an experience. We all feel we have really seen something to remember. There is also a real sense of anticipation about putting the video together. We captured some really excellent material that, we hope, will do all this justice. My abiding memory? Very difficult. The warmth of the people here? The wise words and inspiration of good old Larry? Wesley and his wisdom so young, coupled with his energy to make this happen? The amazing ceremonies and poignant moments? The tears of the schoolteacher as she introduced the Veterans to her class? Yes, all of these. Have just recorded a final interview with Larry. He is so elloquent and very humbled by the whole thing.Again he said some wonderful things. The Veterans have been put up in the Weert barracks. We said our goodbyes. It was a bit sad to go. Wesley says he’s back to school tomorrow. We now go to the monument again to get some close up pictures which we couldn’t do yesterday because of the crowds. Cloudy today so lucky with the nice weather yesterday too.